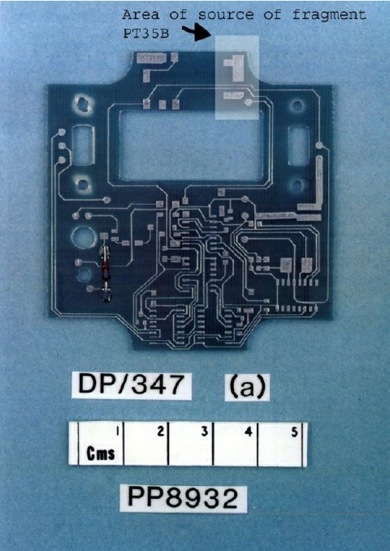 performed on the control sample piece of MST-13 circuit board, DP/347(a). The police report records that these 5 tests were carried out in the period from 28 February 1992 to 6 March 1992, and a summary of these tests is contained in the police report. The conclusion of the report states that while none of the scientists would say conclusively that PT/35(b) and DP/347(a) were specifically the same material or from the same source, equally none were of the opinion that the two samples were radically different. and DC Rolf Buwert (S4649Q). Neither McAdam nor Buwert gave evidence at trial. DP/347(a). Details of these tests follow below. It is apparent from Crown precognitions that the Crown wanted to have the handwritten statements relating to the scientific examinations that had been carried out in 1990, but for some reason these could not be located and only the HOLMES prints were available. However, the handwritten statements of the witnesses spoken to in 1992 were produced and the Crown lodged these as productions 358 to 365 at trial. At the conclusion of the tests Dr Wilkinson produced DP/495 (production 354), a computer disk containing plots of x-ray spectra and data sheet,and she also provided a roll of film containing photographic evidence of her findings, which were detailed in her statement S5579A. had suffered flash burning as a result of blast. sample looked different from the fragment. The fragment’s surface had contained bright “crystallites” 1/2 to 2 microns in diameter, but no such structure was present on DP/494, which contained bright and dark areas 5 to 15 microns in diameter which after analysis were associated with a lead rich metal for the bright areas and a tin rich metal for the dark areas. No copper was found except at the edge exposed by the cutting of the sample. Dr Wilkinson suggested that this was because in DP/494 had a greater thickness of tin/lead metal covering the copper. She stated that, since the original fragment had been recovered from the scene of an explosion, it was possible that the coating material had been lost in the course of the explosion and that lead, which has a low boiling point, had been lost selectively but she said that this hypothesis should be tested by experiment. She stated that she would be happy to testify about the tests she carried out and the results, but that she did not believe she was qualified to comment on the reasons why PT/35(b) was in the condition it was in, as any such comments would be entirely speculative. by the defence and re-stated that she saw differences between the fragment and the control sample, the latter very clearly showing itself to be a 2 phase alloy of bright and dark bits, being lead and tin, whereas this was not obvious from the fragment. dangerous to call her, given her self-professed lack of expertise. NB Wilkinson’s signature is visible on the label for DP/347(a). cut from DP/347(a), which the statements record was labelled DP/504, was retained. 348) and statements were obtained from the three witnesses. source, there being no evidence for them not being from the same source. side, so that the solder mask was for aesthetic reasons and not to act as solder mask. was more a supervisory role, Rawlings having done the work. Linsdell did not give evidence. same source and there was no evidence for them not being- from the same source. the scrapings (DP/496 and 497) from both sides of DP/347(a) and produced spectra. theory and he had not conducted any tests on it. allowed him a control sample to show the presence of solder mask against. Rawlings gave evidence but not in relation to the 1992 enquiries. used in the PCB industry. He produced 2 photographs (DP/499). CP does not mention DP/504 at all. with DP/347(a), and had no recollection of removing a cross section fkom this board. Scottish investigators with any more information. examination on the fragment or any other piece of material. Walker did not give evidence. conclusions were included in his statement. dicyandiamide, both samples being made from chemically similar materials. already been removed from DP/347(a). said it was not possible to state that they had been made by the same manufacturer. (see 2 March 1992, above) that removed DP/504. by the defence before the Crown). He did not give evidence. NB French’s signature is visible on the label for DP/347(a). (prod 353) to illustrate the differences in structures of tin/lead alloys subjected to heat. melting point of electronic grade solder. (7) he stated that DP/347(a) was a commercially manufactured board [in DP/141 he was recorded as saying the copper pad and tracks suggested PT/35(b) could be home-made, but the machined radius of the board suggested commercial machining operation]. of tin or lead rich alloy dependent on the original composition. no reason to doubt the police officers if they indicated that he did carry out tests on it. He was shown DP/498 and likewise had no recollection of examining the sample. In his DP Worroll did not mention the visit in 1992.
identification or the comparison to PT/35(b). said the solderable deposits were thicker on the control sample than on the fragment. electronic solder, as evidenced by his phase diagram (DP/507). analyses of DP/504 and PT/35(b) later. report which by the time of the police report had been received (DP/510). could have altered the surface of the track face of the sample. was shown DP/347(a) at precognition but had no recollection of examining the board. procedures on a fragment of the sample board which had been removed previously. could affect the composition of the solder. Johnson did not give evidence. His report, DP/510, was production 355. NB Worroll and Johnson’s signatures are visible on the label for DP/347(a). microscope and produced 2 micrographs, A and B, designated DP/508 (prod 347). Whitehead’s conclusions were said to be noted in the statement obtained from him. some time earlier than the copper foil for PT/35(b). manufactured by the same process. there would be a no identifiable changes in appearance under scanning electron microscope unless the foil was exposed to temperatures over 800 degrees, which would melt the copper. None of the samples showed signs of melting. In his DP Whitehead did recall the 1992 investigation. His DP was taken after his CP. the same manufacturing technology of copper foil, but were not identical. NB Whitehead’s signature is not obvious on the label for DP/347(a). Whitehead was the last expert to examine DP/347(a) in 1992.
circuit board of similar manufacture to the control sample obtained from MEBO.